The State Bank of Vietnam (SBV) launched two sets of treasury bills worth VND 6 trillion (USD 268 million) on February 23. The T-bills are government bonds issued by the finance ministry with terms of less than one year to assist in financing of the state budget, and are an important tool for the central bank to operate monetary policies. The SBV said the bidding on the bills were combined with competitive and non-competitive interest rates, with the bills with non-competitive interest rates not exceeding 30 percent of the total bid volume. The central bank offered two types of bills in two sessions. Accordingly, the first session had bills worth VND 3 trillion, with maturities of 26 weeks. Payment must be completed within the day, while the due date is August 23, 2016. The second session saw the issue of bills worth VND 3 trillion with maturities of 39 weeks. Payment must be completed within the day, with November 22, 2016 being the due date. The treasury under the Finance Ministry has issued VND 20 trillion in T-bills in eight sessions so far this year. 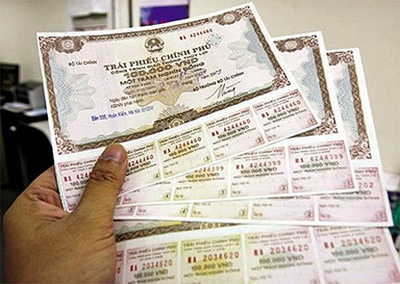 It has also offloaded government bonds worth nearly VND 21.3 trillion so far this year through the Hanoi Stock Exchange (HNX), the bond auction organiser./.